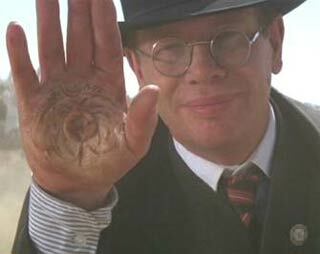 Spielberg: Our biggest dispute was that I had this heavy-metal view of the character of Toht (Ronald Lacey). I saw him with a prosthetic hand that was in fact a machine gun and a flamethrower. He was like The Terminator before The Terminator. We’ve got the artwork to prove it. That’s where George put his foot down and said, “Steven, you’re crossing out of one genre and into another.” I agreed. All that hard work just became refuse in the art department. ~ by hardboilingparadise on 28 May, 2008.